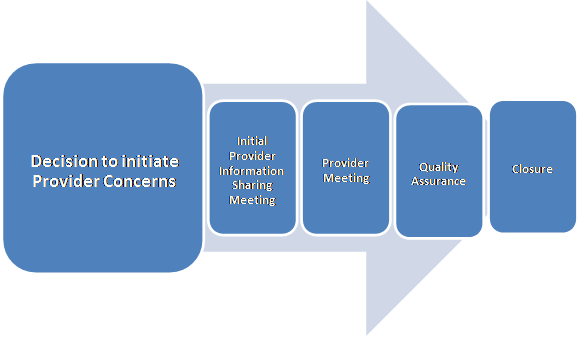 The decision to initiate a Provider Concerns process may be the outcome of a Quality and Safeguarding meeting, or considered through other means for example, consequence of a Safeguarding Adult Review (SAR) (see Safeguarding Adult Reviews) or a serious concern that meets the agreed provider concerns threshold criteria above. A risk management plan should be drawn up and updated throughout the process. Where there are high risk concerns, there will be a need to put in place safeguards and agreed triggers to escalate matters. Risk management to be assured that action will be timely and safeguard people on a sustainable basis is essential. Risk will determine commissioning intentions, and be the evidence base upon how decisions are made. Risk management for commissioning authorities may be additional visits both announced and unannounced. Training support for example, an occupational therapist ensuring the right slings are used to reduce immediate risks of falls. The level of risk should be shared with the provider and frank discussions about any proposed action that might be taken by commissioners, providing adults are not put at further risk by doing so. Providers should be encouraged to find solutions to mitigate against risk. Actions might include providing additional resources to support improvement planning, resourcing training, and purchasing new equipment. Timescale: Actions to be completed within five working days. 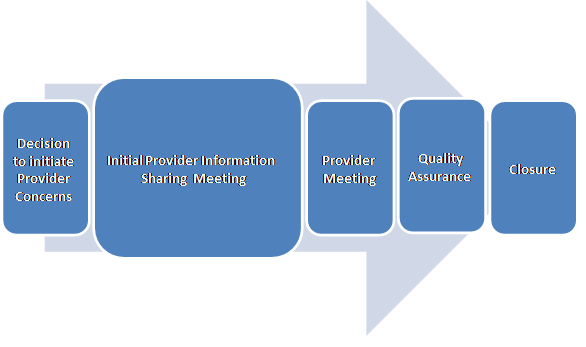 set date for follow up provider meeting. 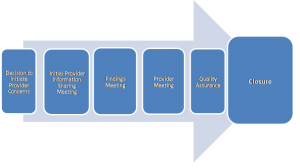 professional assessment of documentation for example care plans and risk assessments. Safeguarding planning will address alleged issues with suggested methodology for enabling decision making about whether improvements are needed or not, and who has the appropriate skills to carry out the enquiry. how information and advice is provided to include adults who fund their own care. 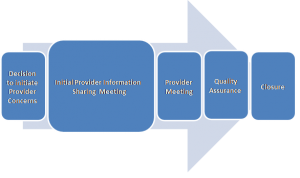 The chair will inform the provider that it is subject to the Provider Concerns process and share as much information as possible, without compromising any subsequent lines of enquiry. They will be informed of the process and provisional timescales if available. If there is a criminal investigation, the provider will be informed in accordance with Police advice. Adults who use services should be provided with the opportunity of shaping and influencing the quality of services and be kept central to the process. In a residential setting, service users and their families may become anxious about increased activity, seeing more visiting professionals etc, and have the right to be informed, but care should be taken not to raise anxiety. Information sharing should always include adults who use services and their carers so that they are able to make informed choices and retain their independence. record their views so that they are considered in the organisational risk management plan. Adults should be provided with the means of sharing their experiences independently of the provider, and if it is deemed necessary a link worker for adults and their families should be identified and a dedicated phone line available to raise issues in confidence. At the very minimum, checks that the provider has taken action in relation to complaints and acted upon service user surveys should be made. Timescales: If possible, actions should be agreed in the risk management plan. Where the concern is about a large organisation or particularly complicated, action may take longer. The provider however should be kept informed. preserve information that may be helpful to police investigations. Where immediate action is needed this should be taken and not be put on hold until the Findings meeting. The chair should be informed and immediate authorisation for action is made. 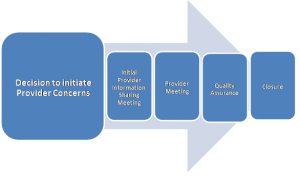 This is a high level plan for measuring the effectiveness of interventions to ensure safety, governance, compliance, clinical effectiveness referencing throughout the experience of adults using the service and their informal network. The coordinator should set out the concerns and risks, which should also include any concerns in relation to mental capacity and the Deprivation of Liberty Safeguards. It is important to distinguish between what is safeguarding and what are quality issues that may impact on safeguarding and prioritise high risk areas. The chair and lead commissioner (if not the chair) should hold a meeting with the provider as soon after the findings meeting as possible. 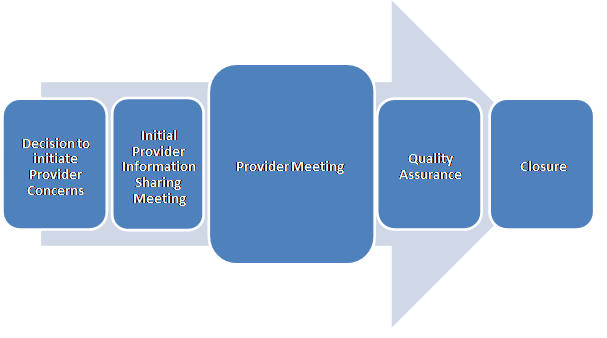 Leads and timescales will be agreed at the provider meeting. 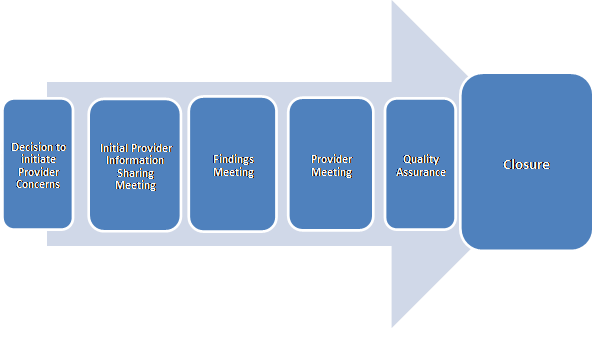 The service improvement plan will be the agreed reference point for assessing and monitoring progress and both the coordinator (who is also the chair) and the provider will retain a copy and update it through a series of monitoring meetings. If there is a contract monitoring officer, commissioner or other relevant member of staff they should be part of these meetings. 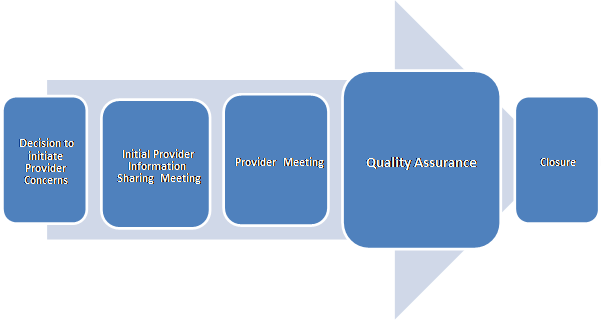 In the event that the provider advises that they are unable to make the improvements or of possible service failure or interruptions, a further meeting with all stakeholders should be convened to assess risks and impact on service users to determine commissioning based on the risk and safety of adults using the service. Further meetings to update stakeholders will be made, if and when necessary. Where there is wide reaching, complex concerns and high risk, it is likely that updated meetings are needed more frequently. 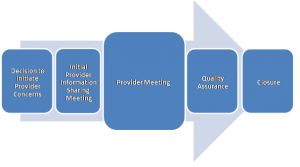 Where there are serious delays by the provider to implement improvements, a further meeting should always be held to consider the level of risk and appropriate action. Focus should be on risk and the impact on adults using the service. It is important to distinguish between what is safeguarding and what are commissioning responsibilities and if further incidents have occurred. Where there is a high risk and likely need to source alternative provision, commissioners should hold a specific contingency meeting. The chair and the coordinator should be invited. 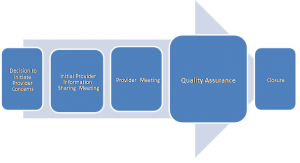 Timescales for further safeguarding meetings are dependent upon progress of the service improvement plan and the level of risk. A quality assurance strategy should be agreed that will rigorously test whether improvements have been attained and can be sustained. This may involve a range of staff with the right knowledge, skills and experience to assess the viability of the improvements and might be the same staff involved in fact finding so that they can provide a comparative narrative. Quality assurance activities may include testing an on-call emergency out of hour’s system by calling at the evening and weekend; assessing the impact of training by competency testing staff; making both announced and unannounced visits. Feedback from adults and carers will act as a control measure to assess whether there has been any noted difference in the service delivery. This may be obtained from holding a follow up meeting with adults in care settings or from a sample of telephone calls to those adults who said that they had experienced a poor service, to see if their view has changed. Support from the local Healthwatch may be appropriate, or other locally managed groups for example Quality Checkers, to add an independent view.